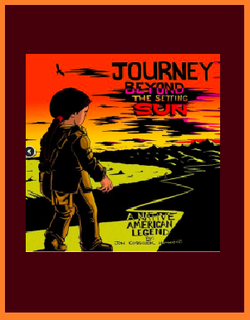 Journey Beyond the Setting Sun is a coming of age story set within the framework of Native American mythology. After the untimely death of his father, young Kitala-Wanji (little one) is filled with many questions. He asks the village wise man how he can handle the pain, how to become a man without his father to show him how, and most of all, what happens to a person’s spirit when they die.The wise man tells him that he must journey beyond the setting sun to find the answers he seeks. The boy travels west to find Raging-Bull, (Chief of the Buffalo Nation) who tells him that he must ask his questions of Wakan-Keha, the turtle who carries the world on his shell. Kitala-Wanji continues west, meeting many animal spirits along the way. He receives guidance from Coyote, leads a herd of many-colored horses across the mountains, and finally reaches the great waters. He builds a canoe, and paddles out into the Pacific, where he meets Orca (the sea-wolf) who agrees to take him to see Thunderbird. until Beaver waddles up, and offers a startling solution. soon as he could hold a pencil. In Portland Maine, Jon became closely affiliated with the colorful artist/poet community, and began to emerge into a modest form of local celebrity. Red Orchid publishing in March 2014. Jon will soon release his second book (a collection of his art, short stories, and comics) entitled The :Ham‘O Collection.